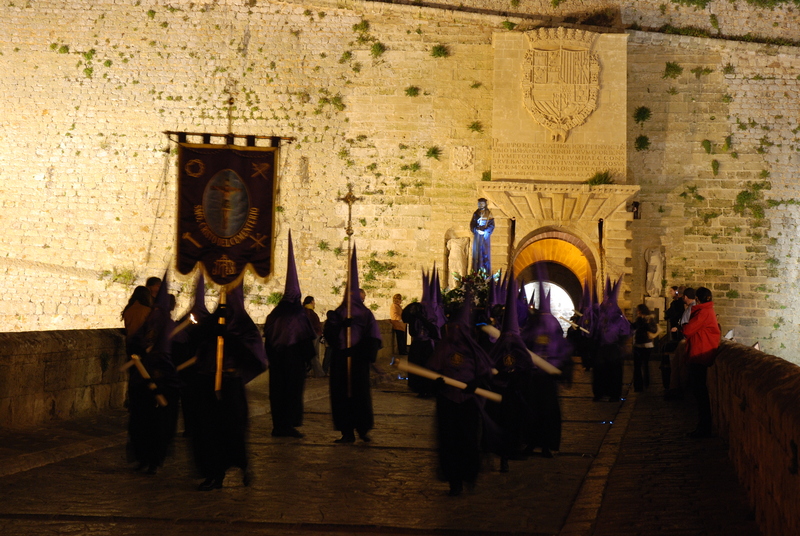 Enjoy the traditional Holy Week processions in Ibiza. Consult the dates, times and itineraries of the processions through the impressive historic quarter of Dalt Vila, a World Heritage Site, and the central streets of the city of Ibiza. – Mass, followed by the Friday of Sorrow procession, which leaves the Cathedral at 9pm to go to the Plaza de España, where it will meet the Brotherhood of Christ in the Cemetery [Cofradía del Cristo del Cementerio] and then proceed together to the Patio de Armas. Miserere performed by the Choir Puig d’en Valls and the return of Christ of the Cemetery to Santo Domingo and of Our Lady of Sorrows [Nuestra Señora de los Dolores] to the Cathedral. – 7 pm: Mass in Sant Elm followed by the procession of the Most Holy Blood of Christ [Santísimo Cristo de la Sangre] through the streets of the Marina. Brotherhood of Our Lady of Piety [Nuestra Señora de la Piedad]. – 9:30 am: Presentation of palms of the Brotherhood of the Holy Recumbent Christ [Santo Cristo Yacente] in the Town Hall Square. Blessing in the church of Santo Domingo and procession to the Cathedral. Mass and concert of the Holy Recumbent Christ Music Band. – 9:45 am: Blessing of palms of the Brotherhood of Our Lady of Piety in Sant Elm and the procession of the Donkey of Christ of the Cemetery from Sant Elm to Santo Domingo. – 10 am: Blessing of palms of the Brotherhood of Our Lady of Sorrows [Nuestra Señora de los Dolores] in the church of Santo Domingo and the procession to the Cathedral, followed by a mass. – 10 am: Blessing of palms of the Brotherhood of Our Father Jesus of the Great Power [Nuestro Padre Jesús del Gran Poder] in the Parque de la Paz followed by a procession to the church of Rosario and mass. -10.30 am: Blessing of palms of the Brotherhood of Our Fathers Captive Jesus [Nuestro Padres Jesús Cautivo] in Plaza Vincent Calbet, followed by a procession to the church of Santa Cruz and mass. – 11 am: Departure of the procession of the Brotherhood of Most Holy Christ of the Cemetery from the church of Sant Elm to the church of Santo Domingo and mass. – 12.30 pm: Procession of the Little Donkey [La Borrequita] with Holy Christ in Agony [Santo Cristo de la Agonía] from Plaza Sa Graduada to the church of Santa Cruz. – Hand-kissing ceremony of Our Father Jesus of the Great Power after mass at 7pm in the church of Rosario. – 7:30 pm: Mass and procession of the Holy Christ in Agony and the Virgin of Hope [Virgen de la Esperanza] in the church of Santa Cruz. – 8 pm: Mass in the church of Santo Domingo, followed by the procession of the Brotherhood of the Most Holy Christ of the Cemetery through the streets of Dalt Vila. – 5:30 pm: Via Crucis in Ibiza prison of the Brotherhood of Our Father Jesus Captive. – 8:30 pm: Mass in the Cathedral in honour of deceased members of the Brotherhood of Holy Recumbent Christ and procession around the Cathedral with the Holy Recumbent Christ Music Band. – 8 pm: Procession of Our Father Jesus of the Great Power from the church of Rosario to the Cathedral. – 7 am: Dawn Rosary. Procession of the Virgin of Hope from the church of Santa Cruz to the Cathedral. – 10:30 am: Chrism Mass in the Cathedral. – 7 pm: Mass In Coena Domini in the Cathedral. – 7 pm: Mass of the Lord’s Supper and washing of feet in the church of Santa Cruz. Brotherhood of Jesus Captive. – 8 pm: Procession from the church of Santa Cruz to the Cathedral. Brotherhood of Jesus Captive. – 9 am: Via Crucis of the Holy Christ in Agony from the church of Santa Cruz to the Cathedral. – 6 pm: Service in the Cathedral. – 8 pm: Procession of the Holy Burial [Santo Entierro] from the Cathedral to Paseo Vara del Rey, with all the Vila Brotherhoods. – 10.30 am: Blessing of the new image of Our Father Jesus Resurrected [Nuestro Padre Jesús Resucitado] of the Brotherhood of Jesus Captive. Mass and procession of the Encounter of the Resurrected Christ with his Mother in Paseo Vara del Rey. – 12.30 pm: Easter celebration mass in the church of Santa Cruz.